Venus, the goddess of love, represents female relationships and social interactions at every level. She rules our social attitudes and behaviour, along with our aesthetic tastes and artistic inclinations. 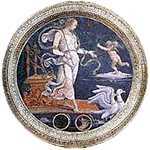 Venus, queen of taste and of the arts, represents the principles of harmony, justice and equilibrium. Known as the Morning Star and also as the Evening Star, Venus, the second planet from the Sun, is pretty much a sister planet to the Earth—although the Shining Planet currently has no moon. Brighter than any star in the sky, Venus is almost the same size as Earth, though scientists tell us the planet is somewhat less dense and has a day that lasts more than a year! Curiously, the Sun rises in the west and sets in the east on Venus, due to her unusual retrograde rotation. The Love Goddess spends around four weeks on average in each sign, taking a little under one year to complete her journey through all twelve signs. Venus turns retrograde only once every eighteen months, for around 42 days, being stationary for some 11 days. From a romantic point of view, Venus in a man's chart shows the kinds of women he desires instinctively, whilst the placement of Venus in a woman's chart indicates the ways in which she is likely to present herself in order to attract the interest of romantic partners. Now Venus also rules desire in all its forms. The word "venereal" refers to diseases of Venus. So she is strongly focused on sexual interactions, but since she can be rather avaricious, Venus also governs the flow of money and the financial conditions in our lives; so the word "venal" expresses the grasping side of Venus.